Bay leaf (plural bay leaves) refers to the aromatic leaf of the bay laurel (Laurus nobilis, Lauraceae). Fresh or dried bay leaves are used in cooking for their distinctive flavor and fragrance. The leaves are often used to flavor soups, stews, braises and pates in Mediterranean cuisine. The fresh leaves are very mild and do not develop their full flavor until several weeks after picking and drying. The bay laurel tree has been cultivated since the beginning of recorded history; it originated in Asia Minor, and spread to the Mediterranean and other countries with suitable climates. Bay leaf is not grown in northern regions, as the plants do not thrive in cold climates. Turkey is one of the main exporters of bay leaves, although they are also grown in areas of Albania, France, Belgium, Italy, Russia, Colombia, Central America, North America, and India. The laurel tree from which the bay leaf comes was very important both symbolically and literally in both Greece and Rome. The laurel can be found as a central component found in many ancient mythologies that glorify the tree as a symbol of honor. Bay leaves are one of the most widely used culinary herbs in Europe and North America. In the Elizabethan era, some people believed pinning bay leaves to one's pillow on the eve of Saint Valentine's Day would permit one to see one's future spouse in a dream. In large pot, heat oil over medium heat. Add sausage and cook about 5 to 7 minutes. Add onions and peppers. Stirring and cook until tender. Stir in thyme and garlic, cook about 1 minute. Add beans, salt, pepper, crushed red pepper, bay leaf, parsley and chicken broth. Bring to a boil, reduce heat and simmer, until liquid has reduces. Remove bay leaf and discard bay leaf. Serve over cooked rice. Enjoy! Help spread the word about Christine's Pantry. Share this post. There's additional share buttons on the sidebar. Looks like it is time to retire that box mix and make it from scratch. Inspiring and delicious post! I didn't know any of that about the bay leaves!! Red Beans and Rice is my husband's most requested dish, and I have to admit I've not made if for him recently. Our recipes are similar, but I think I'm going to pop your version together for him this week! He will be a happy guy! That's true Christine, bay leaves is very aromatic. we often use in Indian cooking. Red beans are my favorite with rice. Great looking dish with sausages and rice, very hearty and delicious! We love beans and rice - yours looks interesting with the addition of the bay leaf. I will try it your way next time. I always enjoy your blog- keep up the nice work! Christine I make mine almost the same way...such a good dinner for this time of year. Christine, this sounds so delicious. I love red beans and rice and the smoked sausage makes this sound perfect. what an interesting combination - red beans and rice, never thought of cooking both together. I've said it again and again, I love the sausage! I too use bay leaf quite often and thats a great outcome you have made with the same leaf. I use bay leaf a lot too. This dish looks so delicious and comforting. Perfect for winter! It's funny - every recipe I have says to remove the bay leaf. However, the tradition in my family is if you get it (don't eat it) it's good luck! So....I leave mine in! I have not had red beans and rice in forever, thanks for inspiring me to make it soon!! I also always leave my bay leaf in my dishes. 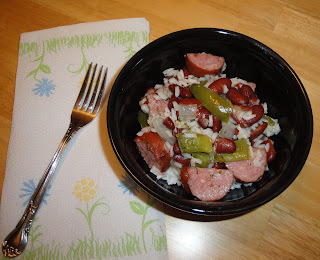 It is always my hubby who gets it :) Red beans and rice are one of my winter comfort foods. You are reminding me to go make some. Love this recipe! Mmmmm...we love eating smoked sausage this way! Delicious! Red beans and rice is a staple dish in our household, but your recipe differs from mine. Next time I'll mix it up and try yours! I love hearing from you all. Just love it. Yippee!! This reminds me of meals I had growing up. Sometimes my mom would use pinto beans instead of red beans. Bay leaves are always in my cupboard. To me they're a big part of Creole cooking. Love this post!